Blessed with warm, clear water and abundant marine life, it’s not surprising that Egypt’s Red Sea has long been considered one of the world’s top scuba diving destinations. A wealth of different liveaboard and land-based package deals make it easy to plan your vacation; while the diversity of the Red Sea's reefs means that there’s something for everyone - whether you’re interested in bucket list megafauna or hard-to-find macro species. Ranging from the wreck-littered north to the more remote south, Sharm El Sheikh, Hurghada and Marsa Alam are three of the region’s most iconic dive spots. Wherever you decide to go, here are five of the many reasons to choose the Red Sea as your next dive destination. Note: Please check up-to-date travel warnings before planning a trip to Egypt. Diving conditions in the Red Sea are idyllic, with water temperatures rarely falling below 71°F/22°C even in the depths of the Egyptian winter (December - February). In summer, water temperatures in the southern Red Sea typically reach 86°F/30°C - making it possible to plan multiple dives without getting chilled. Topside weather conditions are equally pleasant, with temperatures ranging from 68°F/20°C - 104°F/40°C depending on the time of year. Visibility is usually excellent, and can sometimes reach a dizzying 130 feet/40 meters. This incredible clarity transforms the area’s teeming reefs into a veritable aquarium, providing the perfect conditions for underwater photographers hoping to get that perfect shot. The abundance of warm, clear water helps new or inexperienced divers to feel comfortable underwater, making the Red Sea an excellent choice for those hoping to sign up for an entry level scuba course. Above all, the Red Sea is renowned for its reefs, which remain stable and healthy at a time when other major reef systems are suffering from the effects of climate change and marine pollution. 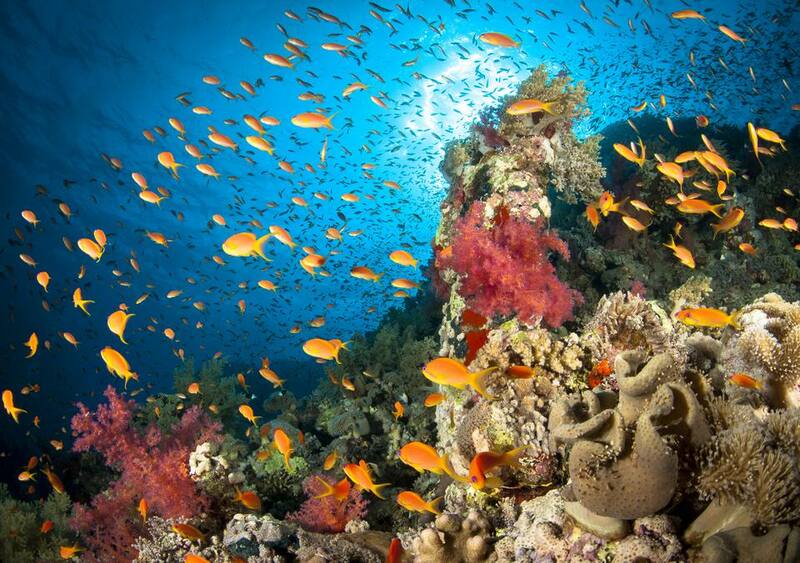 In total, the reefs of the Red Sea support more than 220 different species of hard and soft coral. Together, these corals provide the basis of an ecosystem that offers both food and shelter to more than 1,100 species of fish, almost a fifth of which are found nowhere else on Earth. Perhaps the most famous of the region’s pristine reefs are those of Ras Mohammed National Park, a marine reserve located at the southernmost tip of the Sinai Peninsula. Established in 1983, Ras Mohammed is Egypt’s oldest national park and constitutes a 480-square-kilometer sanctuary for a proliferation of corals and marine life. Other unforgettable reefs include those of the Giftun Islands and the Straits of Tiran. The Red Sea is also a prime wreck diving destination, with a bevy of world-famous wrecks including several from the Second World War. Undoubtedly, the most iconic of these is the wreck of the S.S. Thistlegorm, a merchant vessel drafted for military use in 1940. In October 1941 she was attacked by German bombers whilst carrying supplies to North Africa. Today, she lies at 100 feet/30 meters, her split hull revealing wartime treasures including motorbikes, weapons and armored cars. Just north of popular resort town Hurghada lies the Shaab Abu Nuhas reef, whose treacherous shoals have claimed many ships over the centuries. The reef’s most famous casualties include the Giannis D, a cargo vessel sunk in 1983; the Carnatic, a merchant ship sunk in 1869; and the Chrisoula K, a freighter sunk in 1981. All of the Red Sea wrecks have a unique history, and visiting their final resting places is an incredible way to experience their stories firsthand. For many divers, a visit to the Red Sea is an opportunity to see some of the underwater world’s most charismatic species. During the warm summer months (May - July), plankton blooms in the northern Red Sea attract filter-feeding behemoths, including the whale shark, renowned as the world’s largest fish; and the balletic manta ray. Summer is also a good time for spotting schools of the endangered scalloped hammerhead shark. For shark-lovers, southerly reefs like Brothers, Daedalus and Elphinstone offer the best chance for swimming with the elusive oceanic whitetip. These magnificent sharks have a reputation for unpredictable behavior, but with the guidance of a knowledgeable​ operator, it is possible to safely encounter them in their own environment. Other megafauna highlights include the dugongs of Abu Dabbab lagoon near Marsa Alam and the friendly spinner dolphins of Samadai Reef. Land-based dive resorts are an excellent choice for those with non-diving friends or family, and the Red Sea has plenty of these to choose from. However, it is Egypt’s liveaboard industry for which Red Sea diving is most famous - and for serious divers, these are often the better choice. Spending a week or two aboard a dedicated dive boat means more time on (and under) the water, affording you the chance to experience a greater variety of dive sites. Most itineraries last for at least seven days and usually focus on either the northern or southern dive sites. The size of the dive group, the level of luxury onboard and what’s included in the trip all depends on your budget and the operator that you choose. Generally speaking, you can expect to benefit from knowledgeable dive professionals, comfortable accommodations and excellent cuisine in addition to the wonder of the dive sites themselves. Perhaps the most amazing thing about Red Sea diving is that this wealth of world-class experiences comes at an incredibly low cost. Egyptian tourism has taken a significant knock in recent years thanks to safety concerns raised by terrorist attacks and political instability in some areas of the country and as such, many dive centers are offering rock-bottom prices in an attempt to revive the industry. Diving hotspots including Sharm el-Sheikh, Hurghada and Marsa Alam are still considered safe by UK and US travel advisories. While a PADI Open Water dive course will set you back approximately $550 in the Florida Keys, the same course costs around $360 in Sharm el-Sheikh making it one of the cheapest places in the world to get scuba certified. Qualified divers can sign up for a two-tank dive for $60 in comparison with an $85 fee in Florida. Diving and accommodation packages like this one also offer amazing value for money. In an indication of the cost comparison for liveaboards, the Aggressor fleet rates for 2019 price a 7-night Red Sea trip at $2,355 per person, while the same length trip in the Bahamas, Fiji or the Galapagos costs $2,995, $3,595 or $6,595 respectively.